The key is to move your joints through their normal range of motion. 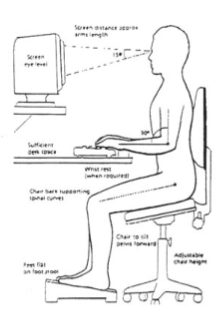 Inquire about computer software that is set to interrupt work at chosen intervals with appropriate stretches, or set your onscreen timer to remind you to take “micro-breaks” as needed to momentarily change your arm position or to shift your weight. You can find some great ‘Exercise Breaks’ at www.computerfit.com. Talk to us – RSI can be prevented, but if symptoms do occur, early intervention is the best form of treatment. If you are experiencing regular or increasing discomfort while sitting at your computer, take early corrective action. Endurance Rehabilitation and Wellness Center, PC will listen to your symptoms and assess you to help provide appropriate treatment, including information about correct posture and positioning at your workstation. They will also work towards an earlier return to your daily lifestyle as well as provide guidance on how to prevent recurrence of injury. Our Physical Therapists are Doctors of physical therapy, trusted healthcare professionals who assist people of all ages and lifestyles to gain and maintain their desired level of active living and physical functioning. With our applied knowledge and understanding of the human body in action, we are able to help you to increase mobility, relieve pain, build strength, and improve balance and cardiovascular function.